The Islamic Movement in the United States manifests primarily as an espionage and counterintelligence threat, not merely as a “terrorist” threat. President Clinton’s Islamic Advisor Abdurahman Alamoudi, who created the Muslim Chaplain Program for the Department of Defense and met with Mr. Clinton more than any other muslim in America, was an Al Qaeda financier who is now in federal prison. Senator Richard Durbin’s go-to guy for all things Islamic prior to his hearing on the civil rights of muslims in America was Mohamed Magid and the Islamic Society of North America (ISNA). Magid was the leader of the Islamic Society of North America (ISNA) which was identified by the Department of Justice as a Muslim Brotherhood organization and a financial support arm for Hamas leaders and Hamas groups overseas. The Islamic Movement also identifies conservative threats to their Movement and targets them for destruction, ensuring they lose their influence. When Irving, Texas Mayor Beth Van Duyne publicly decried the Sharia Courts in Irving, she was targeted by muslim leaders. Several months later the Clock Boy Operation was launched against her. Democrats attacked her for her “civil rights” failures in the incident, and Republicans called for a review of the zero tolerance policy in incidents of this nature. Mayor Van Duyne was left standing alone as Islamic leaders planned. Most Patriots aware of Milwaukee’s Sheriff David Clarke were drawn to him for his outspoken call for law and order, strong stance on national defense, and for boldly stating America needs to police muslim communities. Sheriff Clarke was also considered for positions inside the Trump Administration. In walks Hedieh Mirahmadi. A classic honey trap. Dr. Hedieh Mirahmadi grew up a shia muslim of Iranian decent who later converted to sunni Islam. Mirahmadi is an attorney with a degree in Islamic doctrine from the As-Sunna Foundation. She is the founder of the World Organization for Resource and Development and Education (WORDE), and the former Secretary General of the Islamic Supreme Council of America. Red flags about Ms. Mirahmadi include her close working relationships with Muslim Brotherhood organizations and leaders like Salam al Marayati, participation in the Muslim Brotherhood’s Countering Violent Extremism (CVE) initiative, and the fact she publishes articles about Islamic doctrine (sharia) that are patently false despite the fact she has a degree in the subject. Most notably, Ms. Mirahmadi works with federal agencies and police organizations around the United States to discuss “extremism” and the Muslim Brotherhood. Yet, none of the groups with whom she works have demonstrated any level of understanding of the jihadi’s doctrine – sharia – nor the Muslim Brotherhood network and their modus operandi. In fact, the agencies with which Mirahmadi work, have a completely counter-factual understanding of sharia and the Muslim Brotherhood. When articles written by investigative journalist Laura Loomer were published a year ago about Hedieh Mirahmadi’s questionable background, Sheriff Clarke publicly attacked and mocked Loomer. This week Sheriff David Clarke admitted he was duped, and openly stated Hedieh Mirahmadi is a Muslim Brotherhood operative. 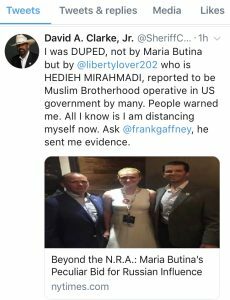 The lesson for everyone reading this article is that David Clarke is one of many Patriots who have been duped by Muslim Brotherhood operatives acting on behalf of our Islamic foes, even if they are not intentionally doing so. Twenty years Abdurahman Alamoudi was the “pillar of the Islamic community in Washington, D.C.” and turned out to be an Al Qaeda operative. After 9/11, Anwar al Awlaki was considered the “new face of Islam in America” and gave presentations at the Pentagon and the U.S. Capitol, but turned out to be an Al Qaeda operative killed in a U.S. drone strike in 2011. In 2005, FBI Special Agent in Charge of the Washington Field Office Mike Rolince gave Mohamed Magid an award, and in 2016 FBI Director James Comey presented Magid with the FBI Director’s Award. Mohamed Magid was the President of the Islamic Society of North America (ISNA), identified by the Department of Justice as a Muslim Brotherhood organization which seeks to overthrow the U.S. government and establish an Islamic State. Evidence entered into the largest terrorism financing trial ever successfully prosecuted in American history (US v HLF, Northern District of Texas, 2008) reveals ISNA provides financial support to Hamas organizations and Hamas leaders overseas. The threat from the Islamic Movement in the United States manifests itself primarily as an espionage and counterintelligence threat, not merely as a “terrorist” threat. It is high time the U.S. government treats Islamic spies working to destroy America the same way it treated the Rosenbergs. Islamic operatives of influence I find in my opinion, far more cohesive, dangerous and penetrating, than soviet style propaganda, with the use of the selective information, marketing a peaceful mantra to numb the mind like a opioid drug and the organizations to present a professional face, denying and hiding the goal of subversive activity and the harnessing of our youth. It has been so effective that it is cloud like. It is perfect gas lighting technique to undermine the society about itself, with the constant stories about racism, greed, terror to weaken any confidence of our existence and government and our own value. This all the while hiding the 1400 years of Islamic terror that takes place daily. Syria is still the most confusing of conditions. Curious to know if the use of chemicals to kill, Russians in the U.K., could have been actually have been islamic jihad to divert any cooperation with Russia to fight Islamic terrorism, since they have penetrated major cities in Russia? Or have I been subject to misinformation by reading the letter Putin wrote with the handprint, to the NYT (I think back in 2013).Just an opinion….and very curious. I am not surprised… so many European leaders have been sucked in to the rhetoric and propaganda of Islamic leaders for years….What I fear for the United States is if these Muslim Brotherhood operatives infiltrate the very agencies that investigate such matters, I remember reading some time ago that the French authorities caught Islamic operatives working in their nuclear facilities. One can never be too naive about Islam. Then respectfully Sir you should know that talking to Law Enforcement is talking to the wrong people. All that Law Enforcement needs to know is: Stand Aside. Brendan, it is true as it appears, cities are political and their police may be forces to reflect the tone and in some cities the tone is calling the facts to be called “hate speech”, “racism” and listening to the deceptive advisers of influenced politicians from the far left Sharia law creeps in unseen to forbid true knowledge,joined with the left that seems to be ready and willing to remove our Constitution, free speech, accurate media, possible loss of gun ownership, and future protection from the radical elements who are accommodating the fundamental crush of America. The movie makers, media and left world government are reluctant to report some of the conditions of Capetown SA the outrageous brutality to food producing white farmers and the citizens when history is denied, land ,power and facts are replaced by unleashed revenge and rainbows turns dark, in my opinion and years of social justice instead of social peace. Something to learn about the protests to demonize and hide behind a mask….violence is best to stop. On the other hand, unless said varied grouping of contextually potential targets aren’t all ready predisposed to commit treason in time of war*, would it not obviously follow that any police chief, elected official, FBI Director, business leader. Priest, Pastor or Rabbi (assuming they aren’t marginal morons) would have by now developed sufficient acuity to sense — thus see through — any attempt by a sharia-adherent Islamic operative to co-opt their participation in capital crimes against their own country? The crux of the problem we face, as I see it, however, is not a lack of awareness, or even widespread stupidity, its a looney-tune adherence to political correctness and an insidious burgeoning apathy with respect to the enforcement of our immigration laws, the Constitution and national security. And as if that weren’t enough, according to frontpage.com, not only has U.S. higher education been transformed into “indoctrination chambers for cultural Marxism, identity racism, and other anti-American ideas”, efforts are underway to similarly indoctrinate & propagandize the country’s K-12 public schools. Anyway, with respect to a possible glimmer of light at the end of the tunnel; according to one high ranking elected U.S. official who has read them, “the 28 pages primarily relate to who financed 9/11, and they point a very strong finger at Saudi Arabia as being the principal financier”; he then added, “I am speaking of the kingdom” or government of Saudi Arabia”. . . . “This is a pervasive pattern of covering up the role of Saudi Arabia in 9/11 by all of the agencies of the federal government which have access to information that might illuminate Saudi Arabia’s role in 9/11”.Amen! *Anyone wishing to confirm that the United States is clearly engaged in a deadly struggle for its literal survival – which at the moment, thanks to a hoard of America hating anarchic subversives its losing! — may (for a nominal handling & postage fee) request a verbatim Arabic-to-English translated copy of Islam’s declaration of war on the country which was seized in accordance with a federal search warrant from a subterranean basement in Annandale, Virginia, by Special Agents of the FBI, in 2004, by contacting http://www.securefreedom.org to request: GOVERNMENT EXHIBIT 003-0085 3:04-CR-240-G U.S. v. HLF, et al. Basic knowledge of Islam is glossed over so much we get caught up in all the diversions. Religion is used as the tool to open doors. Military/Political/Legal Islam requires our attention. This and most other reports have deep time baring developments while diversions are attended too resulting in JIhadist within every aspect of our society that matters. Muhammad/Sharia requires religion to get into your home, Stealth Civilization Jihad has been revealed long ago and we seem to spend time with Reformers and well educated Jihadist explaining ISIS is not Islam. With that, there is no future with Islam in your life, there is no civilized future with Islam in your country, from this standpoint our defense are those like John Guandolo/Phillip Haney/and so many other’s who don’t play around with diversions, our President needs a Anti-Islamic Domestic Force Unit headed up by these Patriots and those they bring on board properly vetted, a sit down with President Trump is the call of Patriots, something must be done now. We are behind the curve, we must react with reason and take no prisoners. The Art of Deception/Taquiyya reguires direct rejection and purging must begin. Not to be dramatic, this is for our children and grandchildren and that requires a new weapon mentioned above. Muslims are nothing if not well organized and disciplined. It is also clear they have a plan to overthrow America that utilizes their well connected network of organizations across America, many of which have successfully infiltrated government agencies as well as NGOs, many of which have been foolish to invite them to form alliances. I was shocked to hear that Sheriff Clarke had fallen into their trap as I would have thought he was well versed enough on their many stratagems of war, as they sometimes call them, to not allow himself to be fooled or intimidated by their lies, but apparently they were able to lie convincingly enough to trick even a seasoned law enforcement veteran like him. That proves just how effective they can be which emphasizes even more just how dangerous a threat it is to allow muslims to remain in America. It is imperative that all Americans be made aware of the serious nature of the threat posed by allowing islam to remain in America. I support your work though many more are needed to join the fight so keep up the good fight, for the price of failing to defeat the enemy is the destruction of America which is something we must never allow. It is quite the flip for the other Brennan, not the above commentator, to suggest that he is being targeted by our new leadership and by having his security clearance revoked, it is an attempt to silence him. He should know a lot about silencing information since he did quite a job at removing and restricting descriptive speech and facts from those who have to protect against sharia law , dawah and jihad. He can still speak to the adoring press, who has also been restricted so as to not “offend our enemy”, at the request of our enemy. He is quite a prince and the flock of birds still fly together to follow the him because he did not just gloss over the information….he colluded to suppress it. In my opinion. Sharia court in a state of USA? What is this nonsense? Lunatics in charge of the asylum. Stop sharia courts. What is this BS?